The following three (3) changes in the Video Review (VR) rules will be effective from the upcoming K1 Premier League in Berlin 2018. If the Coach request VR and two or more Judges show score for the same competitor, the point will be given and the Electronic Card will remain in the scoreboard. If the Coach request VR but in the opinion of the Referee Panel the technique was to hard or uncontrolled and a Cat.1 warning or penalty is given, the Electronic Card will remain in the scoreboard. Should a competitor lose the VR request during the eliminations round, he/she will regain the VR card for the semi-final as well as for any medal bout. 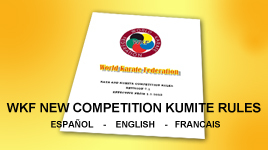 Is applicable for both team and individual bouts (round robin is consist of individual bouts), at all competitions where the official WKF rules are used. This doesn’t apply for National, Regional, Continental or World Championships. WKF Video Review Rules (Version 15th June 2017). Règlement kata kumite 2018 en langue française s il vous plait merci beaucoup.